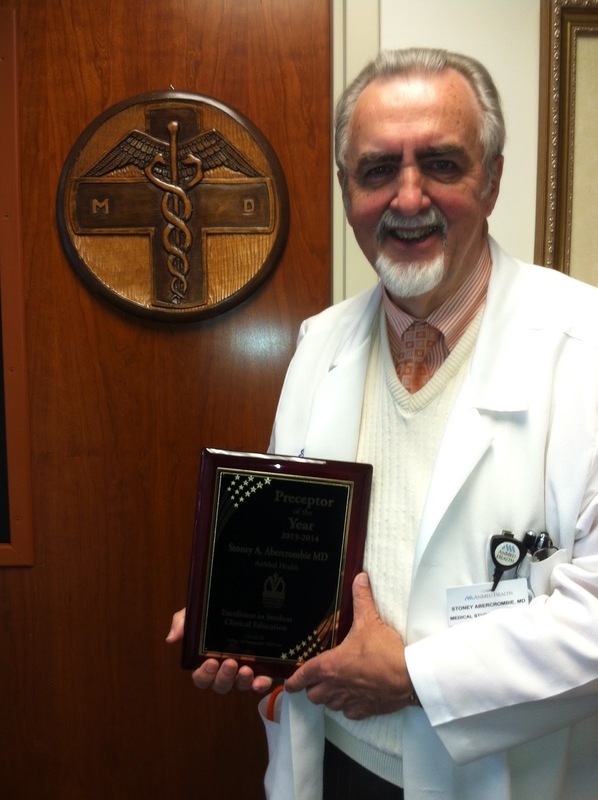 Dr. Stoney Abercrombie, Director of Medical Education at AnMed Health, was recognized as the 2013-2014 Preceptor of the Year by the Edward Via College of Osteopathic Medicine (VCOM) Medical School for Excellence in Student Clinical Education. VCOM Associate Dean Dr. Paul Switzer presented the award at the annual AnMed Health medical staff dinner meeting on October 2. AnMed Health presently has 24 third and fourth year medical students in clinical training. Twenty-three are from VCOM and one is from MUSC. In the summer of 2015, the incoming third year class will have six medical students from VCOM and six from the Medical University of South Carolina (MUSC). A native of Six Mile, SC, Dr. Abercrombie is a graduate of Clemson University, MUSC, and the Family Medicine Residency Program of the Greenville Hospital System. He served as a flight surgeon in the United States Army for two years and practiced for eight years in Seneca prior to entering academia. Dr. Abercrombie has previously served as the Family Medicine Residency Training Director at both AnMed Health and Self Regional Healthcare, as well as serving as the Executive Director of the South Carolina AHEC. Dr. Abercrombie has been recognized as the South Carolina Family Physician of the Year and one of the top ten finalists for the American Family Physician of the Year. He also helped develop the rural residency track in Seneca. Please join the South Carolina AHEC in congratulating Dr. Abercrombie on his achievements!